Offering you a complete choice of products which include formed steel grid and buffer stainless steel grid type ngr. With the assistance of our team of professionals, we are engaged in providing an assorted range of Formed Steel Grid. Steel grid offered by us is manufactured employing excellent quality steel in line with international market standards. 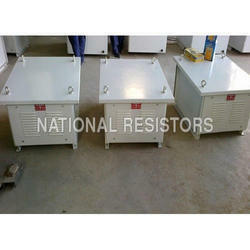 Provided steel grid is mainly used in electrical circuits as the spacer between grid element. The offered steel grid is provided in various specifications and can be customized also as per the requirements of the clients. This Formed Steel Grid is strictly tested on several quality parameters prior to dispatch. Galvanized M.S. washers will be used as the spacer between grid element and the same is insulated from grids by using mica washers. Temperature coefficient of resistance is 0.15% / c for AISI-410 0.094%/ c for AISI-304. The connection between adjacent grid is done by Arc Welding. Grids are formed of AISI - 304/AISI - 410 Stainless Steel materials. IPSS-1-10-002-82 with amendment no.1 and BS 587 for starting/speed control resistor. IS 2147 & IS 12063 of 1987 for the degree of protection for an enclosure. Buffer Stainless Steel Grid Type NGR for application in cranes or another heavy machinery is offered. Looking for “Formed Steel Grid”?